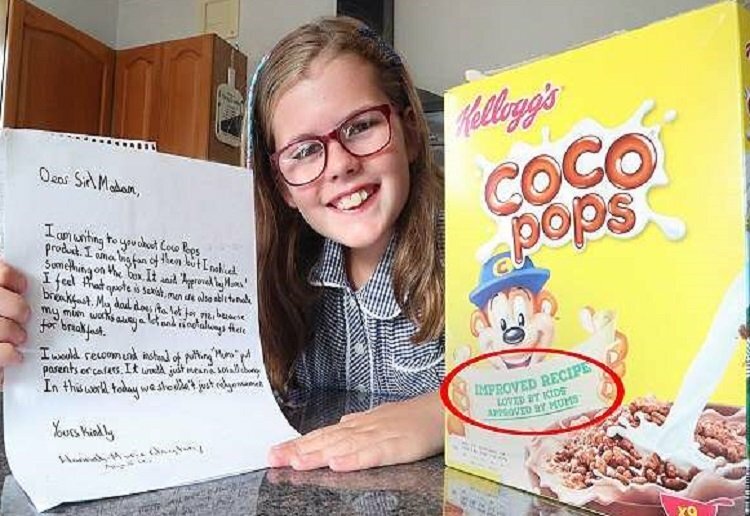 Girl, 10, forces Kellogg’s to change ‘sexist’ slogan on Coco Pops. A SCHOOLGIRL has struck a blow against sexism by persuading Kellogg’s to change the message on its Coco Pops boxes – to show fathers make breakfast just as often as mothers. She wrote to the company pointing out that her father James, 47, a landscape gardener, is often on breakfast duty because her mother Anne-Marie, 48, is an airline cabin crew leader. Kellogg’s has now promised to alter the wording on the boxes to read: “Approved by parents”. It will be on supermarket shelves in November. After receiving a letter from her, the company changed the wording. Hannah-Marie, of Bournemouth, who is a pupil at St Walburga’s School, said: “My mum was away so I was just with my dad when I saw it on the cereal box.